A few years ago, PLANET developed the FGSW-4840S, the best solution for a cost-effective, high-density network application. To further enhance the solution with a more robust Layer 2 management function, PLANET has released a brand-new version of the FGSW-4840S. The brand-new FGSW-4840S is definitely more secure in that it allows the remote system to maintain or configure under security management interfaces. 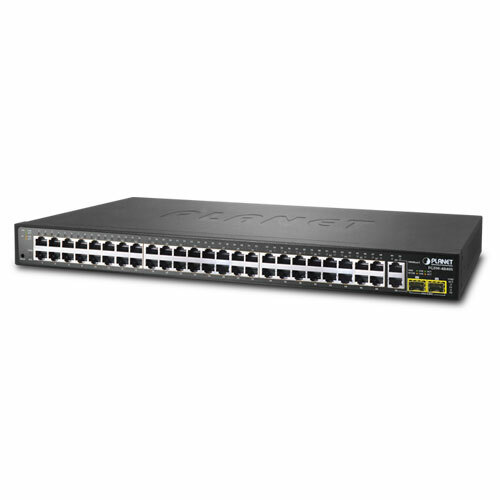 PLANET FGSW-4840S is a 48-Port 10/100Mbps Fast Ethernet Switch with 2-Port Gigabit and 2-Port Gigabit SFP interfaces, which comes with a high-performance switch architecture, capable of providing non-blocking 17.6Gbps switch fabric and wire-speed throughput at 13Mpps. Its four built-in GbE uplink ports also offer incredible extensibility, flexibility and connectivity to the core switch or servers. The powerful features of QoS and network security offered by the FGSW-4840S enable the switch to perform effective data traffic control for ISP and enterprise VoIP, video streaming and multicast applications. It is ideal for the remote access layer of campus or enterprise networks and the aggregation layer of IP metropolitan networks. With 48 10/100Mbps ports and 2 10/100/1000Base-T ports, the FGSW-4840S connects up to 50 workstations in Ethernet environment. The two SFP Mini-GBIC interfaces can be uplinked to a department backbone; moreover, the FGSW-4840S provides a 17.6 Gigabit per second switch fabric and is able to provide high bandwidth for backbone connection. Its MAC/IP/Protocol Access Control list and Port Security limit the number of MAC addresses to be passed through one specific port. IGMP snooping and QoS functions further improve the efficiency of the network and protect the network clients. In an MTU/MDU application, the advanced functionality of the FGSW-4840S eliminates the traditional issues associated with the use of Ethernet. Users can be segregated by advanced VLAN functionality to enhance security and bandwidth managed with tiered bandwidth provision and control through configurable upstream/downstream restrictions. These coupled with the flexible Mini-GBIC 1000Base-SX/LX module options make the FGSW-4840S to be one of the best and most cost-effective switch solutions for multi-tenant service providers. Link Aggregation IEEE 802.3ad LACP and static trunk supports 6 groups of 4-port trunk. 2014-09-03 3.0 Release for hardware veraion 3.0. 2014-10-21 3.0 Initial release for FGSW-2840 and FGSW-4840Sv3.